Well, perhaps not quite everywhere. But there are a few. Now, you are paying attention to the Ranger’s ranting, are you not? He’s been busily finding upside-down and back-to-front gates for your entertainment, but is beginning to suspect that he is the only living soul who actually gives two hoots about this critical matter. 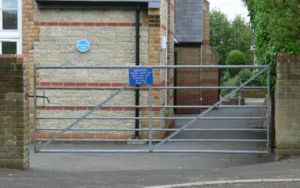 If your faith is wavering, take a look at this shocking pic – taken outside the Ranger’s nipper’s school, you can even see the bolt is bent as the relatively new gate has already dropped – indeed, it looks as though the bolt is the only thing holding it up. The Ranger knows from careful observation that this gate is required to support the weight of several lively boys on regular occasions, and so one would have hoped that the gate-installer would have learnt his lesson, and this gate of all gates would have been put in the right way! This metal farm gate has tension straps rather than compression struts, and the bolt/hinge placement is dictated in its construction, so it is both right way up and right way round! Must agree with you that the metal gate illustrated does look odd with it’s diagonals the other way. the tensioning rod on the big gates (mentioned previously was of course in addition to the traditional diamond brace construction as you rightly say, it could be tensioned to take up any joint movement or shrinkage, thus keeping the gate square. OK, now I’m really wishing I’d called this thread ‘back-to-front gates’. You’re right, of course. It certainly wasn’t installed upside down for the reasons you correctly give. But I still assert that the diagonals are fixed on backwards. They must be more effective if they run the other way – even if it would only apply to half the gate, as in this case. Crook gates don’t really fit into all this as the weight distribution of the whole thing is different, so they don’t really count. Anyway, it would be impossible to get one of them either upside-down or back-to-front. I don’t know about railway gates. All the wooden ones I’ve ever seen have been cross-style diagonals. The gate is the right way up! 1)Looks like a standard welded agricultural gate, hence the “shivers” are graded coprrectly, ie: close at the bottom and wide at the top. 2)If it was installed upside down then the closing bolt would be almost on the ground!! 3) If (closing bolt apart) it was installed upside down it would not matter anyway as both compartments are equaly triangulated and welded! Note: most gates over 1.5 metre span have their PRIMARY triangulation running DOWN from the head to the bottom shiver as in almost all wooden five bar gates (excluding diamond braced), crook top estate gates and the old level crossing gates (these used a metal rod that could be tensioned to take up sag and joint shrinkage. All is not always what it seems. You’re absolutely right – it’s not upside-down at all. The bar spacing is correct. I missed that in the excitement of the diagonal struts – well spotted. I’ll stake my reputation that it’s back-to-front, though! But that is not upside down for stock purposes, being a farming child, the smaller spaces need to be at the bottom to prevent lambs etc from getting through the gate? Is that not the case.